There are 27 states in the USA that are officially “landlocked.” I live in one of them. People in the mid-west are so water-starved that, when it is hot, any body of water; a “crick,” a retention pond, a drainage ditch, an unlocked fire hydrant becomes a vacation resort. It’s sad, really. And no doubt that primal hunger to be connected to some body of water is the reason I am presently digging (by hand) a small pond in my backyard; I just have to have some connection to some H2O. Right now it’s just a muddy hole in the ground but it’s going to be epic. Well, maybe not epic, but it will be pretty. I think. My husband is less than enthused and is certain I am creating a mosquito farm. Mosquitos aside (just keep the water moving, it will be fine! ), a water feature will add so much to the ambiance and will soothe your drought-stricken soul, whether your outdoor space is fancy or rustic or urban. Even if you do have the good fortune to live near an ocean or lake, you will still enjoy your own little private water therapy. The easiest thing to do is a self-contained water fountain; all you do is add water and plug it in. You will find self-contained water fountains in hardware stores, discount stores, garden centers and outdoor living stores. If you like the idea of a small pond, it is a pretty simple process to install. There are preformed ponds available to use; simply dig a hole, drop in the pond, back-fill and enjoy. Or you can go my route, which is to dig a free-form hole and utilize a pond liner, which is also fairly simple to do. If you are particularly ambitious, you can create waterfalls along to add interest to your pond. I plan to use my little pond to attract and support some wildlife. Your backyard pond will invite frogs, toads, newts, dragonflies, snails, and water beetles; purple martins and swallows will feed on pond insects. If you dream of a koi or goldfish pond, it only takes 18-24” in depth to sustain the fish. 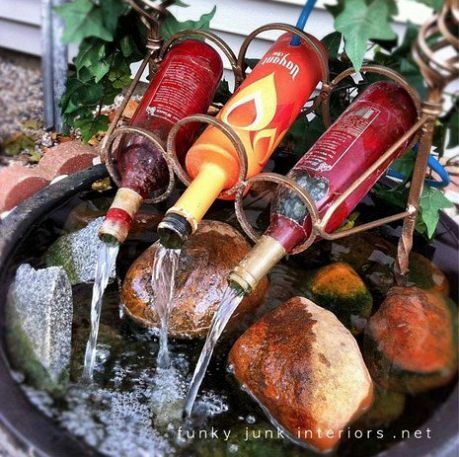 Think about adding a water feature to your outdoor living area this summer and get your zen on. Your soul will thank you for it. Check out our Pinterest board for water features ideas and instructions.